The Falling Popper targets are manually reset version of the 42" Pepper Popper and 28" Mini Pepper Popper. For competition use it is preferred to have the target fall and be manually reset to verify scoring during the match. The targets are made from 3/8" thick AR500 steel, and can be used with all handgun and most rifle calibers. The Full Size Pepper Popper is 42" overall target height with a 12" diameter circular target area. T.. The Mini Pepper Popper is 28" overall target height with a 8" diameter circular target area. The tar.. The Split Full Size Pepper Popper is 42" overall target height with a 12" diameter circular target a.. 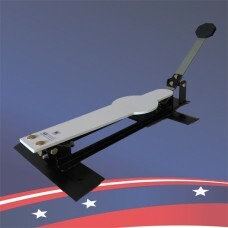 The Crossing Mini Pepper Popper includes two 28" Mini Pepper Popper targets mounted to a common base.. The Forward Falling Bracket can be added to either the Falling Full Pepper Popper or the Falling Min.. The Bird Thrower Adapter can be added to either the Falling Full Pepper Popper or the Falling Mini P..